A gallery of images showing the destruction caused by the second largest earthquake in recorded history. Aerial photo of Portage, Alaska townsite after the 1964 Alaska earthquake, taken near railroad siding. 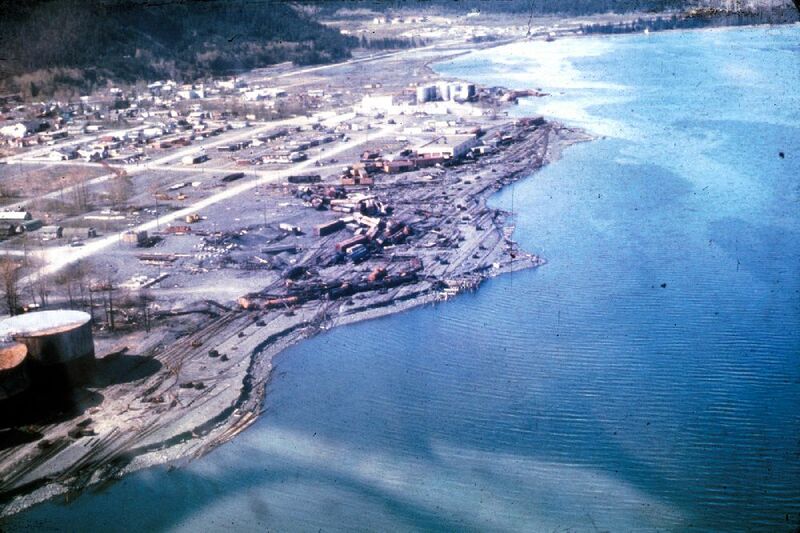 The townsite, and in general most land on the seaward side of the Seward Highway, was rendered unusable by 6 feet of subsidence and subsequent flooding at higher tides. Photo: Public domain, via Wikimedia Commons. The Good Friday Earthquake of March 27, 1964, was the most powerful earthquake in U.S. history, and the second largest earthquake in recorded history. The magnitude 9.2 earthquake, which resulted in 131 deaths (115 in Alaska and 16 in Oregon and California), was centered in the Prince William Sound region of Southcentral Alaska. …multiple fishing boats were sunk as far away as Louisiana. Buildings and roads in many major cities in Alaska experienced significant damage due to landslides, avalanches, and tsunamis. The cities of Seward and Anchorage lost large portions of their waterfronts. Towns like Portage, in Turnagain Arm and Valdez, in Prince William Sound, were completely destroyed. The town of Valdez was able to relocate, while Portage was never rebuilt. The earthquake sent vibrations across the world. Along with tsunamis, the earthquake caused waves in isolated bodies of water such as a lakes and boat harbors, a phenomenon called a seiche. As a result, multiple fishing boats were sunk as far away as Louisiana. “Ghost Forest” Palmer Hay Flats caused by the sinking landscape. Photo: Wikimedia Commons. The following is a personal account from Don Benson, a member of the Pioneers of Alaska, telling his experience during the earthquake. “During the 1964 Good Friday Earthquake, I was 12 years old and home alone. Our house was next to the old Matanuska Bridge on the Old Glenn Highway. I had just gotten home from school and was sledding. It was warm that day and I was soaking wet! I had the fireplace going to get dry in my underwear when the house started shaking. Then more shaking … so I went to the door, (we had a concrete house), like they tell you to do. I didn’t like it so I went out in the yard. The shaking slowed down and I went back into the house. And when the quake came again in about 2 ½ minutes, it got really strong! The bridge was doing a hula dance and moved about three feet in each direction. I had a collie named Prince who was scared to death and never left my side. I was never scared but hoped the shaking would stop. Five minutes was a long time for the house to shake. The earthquake broke some syrup jars so I thought I would be in trouble. My mom came home from work to check on me and that is when I found out how bad an earthquake it was! I think if the bridge would have been out, she would have cleared it as fast as she was going! My dad was at the Palmer Airport. He said the ground started shaking and he thought he was having a heart attack! So he pulled over to the side of the road, got out of the pickup and still couldn’t stand up! We had a friend at the Butte with a high frequency short wave radio so we went out to his place and contacted our relatives in the lower 48 and told them our family was fine. I remember there was a lot of construction afterwards but Palmer didn’t get as much damage as did Anchorage, Valdez and Kodiak. Coastal uplift in Prince William Sound. Photo: Wikimedia Commons. Seldovia flooding after earthquake. Photo: Wikimedia Commons. 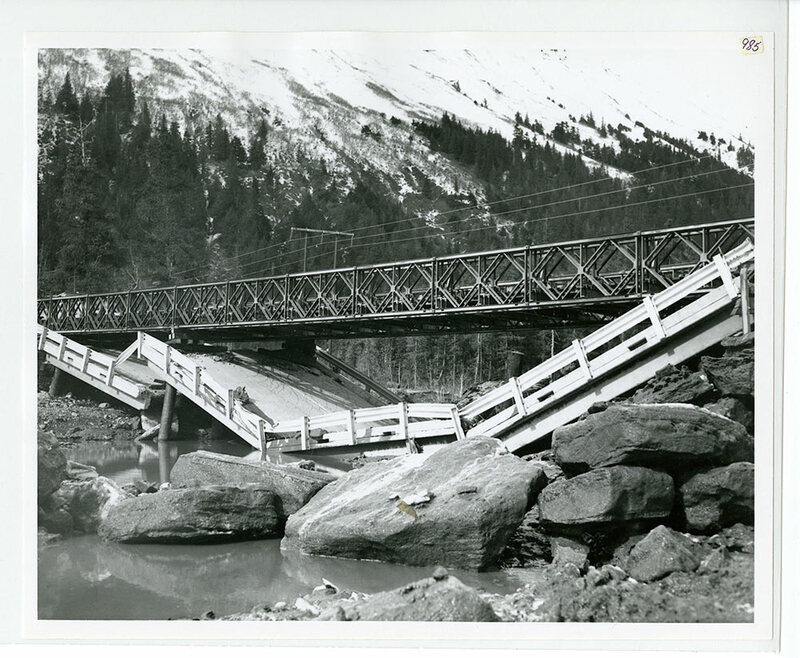 Radical changes in sea level near Valdez, Alaska following 1964 Alaska Good Friday Earthquake. Photo: Wikimedia Commons. From the Historic C&GS Collection. Damage to the Government Hill School in Anchorage. Photo: W.R. Hansen, U.S. Geological Survey, via Wikimedia Commons. You are welcome, and thank you for reading the article! Roberta Cantrell Stout here. I was 7 years old when this happened. We lived in a trailer in Anchorage and attended Creekview Elementary. Fortunately we had just got home from school at the time. I remember the earth shaking and items flying off the walls. My mom was working in the Singer building downtown when it struck. It was next to the J C Penny bldg which was 5 stories high and it fell onto the Singer bldg. My father managed to pick her up and they came home. It was scary but it all turned out ok. I was 13 years old and in Anchorage that day. It was on Good Friday so there was no school that day. I think the death toll would have been higher had it not been on a “holiday”. We lived in our converted school bus for weeks after the quake, with several neighbors!! Quite an adventure. Are you sure it wasn’t Creekside Park in Muldoon area? We lived on Old Harbor Rd off of Muldoon Rd. Still remember the day.I was also 7 years old. My brothers and I were part of the very first students at Creekside Park elementary school. We lived just off Muldoon on Friend. We had moved to Big Delta just before the quake but were back in town for doctors appointments. Had just left the new Boy Scout department in the front section of J.C. Penney’s third floor, minutes before it hit, and that section came down. We all got in trouble for shaking the car in the eye Dr’s parking lot, less then a block from the big trench. We had to stay with a friend on Muldoon that night, then in one of the dorms at the University for several days because the highway to Palmer was closed and we couldn’t get home. I was 5 at the time. We lived in Palmer. My brother took me outside and put me on top of the car. I watched a man get out of his car to check it and the wave in the pavement started moving his car away. Get the interview with Governor Walker, who was 12 years old and living in Valdez, aired on KCAM radio this date 2014! We will have to look for that. Thanks Roger! Cecil, thanks for posting these pictures! I was 8 when the earthquake hit. It had a lasting effect on me as, I’m sure, everyone who was there. You might be interested in getting in touch with Chuck @ 1enrichjudy@comcast.net about the various memorials he is aware of or has personally worked on getting established. Apparently, the State of Alaska recognized the Alaska Air Guard flight crew who went down in Valdez by virtue of HJR 23, 2014 and HB 35 2015. The City of Valdez is also working on a memorial. The Municipality of Anchorage passed permanent legislation by way of a resolution which makes every March 27th a “day of remembrance”. There is also a statewide “Annual Tolling of the Bells.” This was such a major geologic and personal event for so many people, it is nice to know it is not forgotten. Thanks Robin for that information! I was in the Air Force stationed at Elmendorf.. It was pretty exciting out on the ramp next to transport aircraft.. I was at U of A in Fairbanks when the earthquake hit. A group of us were in the cafeteria waking to a table when the floor rolled under our feet. Some one laughed and wondered if they felt it Anchorage where my family lived. We soon heard all communications with cities in southcentral Alaska were out. Some of us sat in the KUAC radio that night waiting for news from the south. It was Sunday before I heard through the Red Cross that my family was safe and well. The girl who lived across the hall from me in the MacIntosh Dorm was from Valdez. Her mother and 2 siblings came to stay in the dorm with her for a time. I learned her father and I think 2 brothers were on the dock waiting for a supply ship to dock and unload when the quake hit. They were lost that day. My uncle was on a tug approaching the Valdez dock when the earthquake hit. He told my mother he had just waved to some kids on the dock when the earthquake hit. They waved back, then a couple minutes later, disappeared. Although I have long since forgotten their names I knew every longshoreman working the SS Chena on the docks at Valdez that day. My uncle was a ships’ mechanic and was on the docks in Valdez when the tsunami hit. He was lost that day also. Thank you for more information. I was 6.5 years old when this happened. It has had a lifetime of impact on me. I lost my dad, Leonard A. Gilliland of Seward, AK. to this disaster. He was a pilot who was helping out with rescue. The plane he was on crashed, all aboard were killed. Thank you for publishing this for Americans to either remember or learn of our countries history. I am very sorry Elizabeth. It’s Alaska history that needs to be remembered. I was 4 1/2 months old and my parents had just moved back to Michigan from Fairbanks. They had a lot of friends who have told me stories for years about traveling around after the quake and seeing the changes in the land and rivers. I remember as if it was yesterday! My two older brothers an I were waiting in the car for our mom who was in a trailer picking something up from her friend when the earthquake started. I was seven and my brothers were 2 and 4 years older. Our car was parked facing east on 36th ave just west of the railroad tracks across the street from Woodland Park Elementary school which is now Boy and Girls Club. My oldest brother thought the car was starting to roll down the hill so he jumped in the drivers seat and stepped on the break then the emergency brake lever before he cried out, “earthquake”! That’s when we bailed out of the car and stood in the middle of the road wondering what to do next. Mom must have totally forgotten about us because she was too busy trying to keep her friend kitchen cabinets closed. As the trailer rocked back and forth, dishes were flying across the room out of the cabinets. About half way through she was able to stick her head out the door to check in us. She yelled for us to go hang on to the telephone pole in the snow bank. To this day I still think she was trying to “off” us! Ha! We watched as someone in a black car must have been racing home on 36th as the ground rose and fell like ocean swells. Looking back we were all blessed that this disaster happened in the spring and not the winter or many more people would have died due to the cold. I was 3 1/2 years old my dad was stationed at Elmendorf. We were on the way to the movies on the base. When the road started rolling my mom grabbed me and ran into the movies. Inside they told her to get out they thought building might fall . I remember we didn’t have water or electric so stayed at someone’s house. At each after shock all the ladies screamed thinking another quake. We have some great pics on slide of the after math. My dad walked around taking them. Mom used to say the best think was it wiped out all the bars on one street ! Have one of the movie theatre markee laying on the sidewalk still attached to building. That’s how far it sunk ! Donna, thanks for commenting. If you ever convert your slides to digital, we’d love to see them! Yes, that would be awesome Donna. I spoke to Mrs. Smalley who said her husband was last seen in his truck parked on the dock with the window down. He was lost in the tsunami. His truck was found still parked on the dock. She got her kids in their station wagon and headed for high ground. She could see water and debris coming toward her as she drove away. She said she was so scared. She moved to Palmer, where I met her and she shared her story. Thank you for sharing Becki. Such a heartbreaking story. Oh, forgot to mention Mrs Smalley was in Valdez during the earthquake. My mother was a senior at East and my dad had graduated the year earlier from West. His mother, my grandmother Phyllis Holliday, was senior level nurse at Providence — her stories are published in a local book about the quake. I’ve grown up hearing the dramatic stories of her just leaving Penneys parking garage and the aftermath she faced working at Prov, as well as stories of my young father rescuing people in turnagain – they lived on Hillcrest Drive at the time. Although I was not alive at the time, through them, I’ve come to respect the power of Mother Nature and pray my kids and I don’t ever have that experience but we are prepared! Is your father Terry Holliday? I was stationed at Elmendorf, 317th Fighter Interceptor Squadron, Weapons Control, on F-102’s, just finished working day shift. The first tremors hit, and after a few moments, stopped. We were on the top floor of the barracks. Then, it started again, and this time, ,more violently, the sun running across the floor and up and down the walls. This time, there was no getting out, but those who managed to escape out of the building before the second tremors said they’d go down two steps, then get thrown back three. The vehicles in the parking lot bounced so violently that it broke shock absorbers. The interceptors in the alert cells got their radomes damaged, and I was one of the crew who changed them the next day. The lights in the hangars were mounted on hooks. At the height of the quake, some swung clear of the hooks, fell on the aircraft below. I think the base had two casualties. Wow, thank you for sharing Earl! Wow great stories and pictures, We moved to anchorage in Aug of 63 and lived in a trailor court where the mercedes dealership is now. Mom had gone across the street to do laundry I was 6 and me and my younger sister were alone watching cartoons. .The trailor started with this low rumble and we were trying to figure out what was causing it. I was trying to boost my sister up to the top of furnace to get my toy fire truck down since i thought it was causing it. We got it down and the place kept rumbling so we ran to the door and mom was walking back with the laundry. We yelled mom mom the house is shaking and it wont stop. To this day i remember her saying Well if you would sit your asses down then the house wouldn’t shake. Thats when it broke loose and mom dropped the laundry We ran to her and we sat in the street. Mom was saying the lords prayer and i just sat there watching trees bending over telephone poles swaying watching a man run out of his tailor looking drunk not able to stand and falling over his fence. It seemed like waves were in the ground and things were exploding, sirens and alarms from the base were sounding We saw smoke fro down toward the docks and then it stopped, Mom was crying and a few minutes layer dad showed up. I think i was young enough not to be scared, since i really didnt understand what was happening. Now when the earth shakes i sit up waiting to see if its the big one, Then lay back down and think no, just another baby quake. Michael Anderson, your comment, “…watching cartoons.” is the first someone else has mentioned this which validates my own memory, also at 6, when the quake struck. I lived on the corner of 11th and B. I’ve tried to validate my memory, and which cartoon it was, but haven’t been able to research that particular detail. I was also 6, and my three brothers and one sister and I were watching Fireball XL5. I was 8 at the time all by myself watching Fireball XL5 when the “big one” occurred. Pretty scary. What stick in my memory the most was having to put all our refrigerator stuff outside in the snow and those awful three series typhoid shots we had to take a few days after. I was 12 and we were living on Elmendorf in base housing. We were watching the TV cartoon Fireball XL-5. The quake started just as a rocket was taking off on TV. My siblings and I thought the rumble was coming from the show. Then all hell broke loose. No electricity, no water. Stood in line for typhoid shots. Dad spent the next several days and nights at work. The cold war fear was that Russia might take advantage of our vulnerability. That evening and it’s aftermath is forever etched in my mind. Oh my goodness Kathy Horst! I just have been reading through these comments, and replied to one a couple above yours, where a Michael mentions he was 6 and watching cartoons. I told him I too, was 6 and watching cartoons, and mentioned how I have always wanted to validate that, and try to find out which cartoon it was. Then after I posted my comment to his, I kept scrolling, and just found your comment mentioning WHICH cartoon! Thank you for that! My memory is clicking now! I’m pretty sure it was traditional puppets. You could see the wires that supported them sometimes. I wonder how many of us were sitting in front of the TV when the quake hit? I also remember my mom standing in the kitchen slapping the cabinet doors shut and my sister keeping the Easter Eggs we were coloring corraled on the dining room table. I was 12 yrs old, my step dad rode me down to my birth place right afer the quake. What a mess!! Don’t remember a lot. I was 13 at the time. Dad was stationed at Elmendorf AFB, but we lived in field-grade housing (across from the ski slope). We were watching “Fireball XL5”. The rocket ship had just blasted off and was moving along the launch rails when the picture flickered then went to a single spot. My little brother started crying, “Bad Fireball. Broke TV.” We had been stationed in Japan once, so Dad had a pretty good idea of what had happened. He looked out the 2nd floor window and turned white as a sheet. I looked and saw the ground coming at us in waves, like on the ocean. Dad threw us on the bed and lay across us. When the shock waves hit, the bed flew around the room like Dorothy’s in the Wizard of Oz. For a young boy, it was certainly an adventure. My Boy Scout troop help by sorting and distributing donated clothes.and canned food. In addition to the response and recovery efforts, I remember all the soldiers were carrying weapons. My father told us that was because of the possibility of wolves or bears. He later told me he said that because he didn’t want to scare my mother, but that the military command was also concerned that the Russians might take advantage of the situation and invade. A week later, we had company over and were all sitting down to dinner. It was around 5:30 and the general conversation was, “It’s been almost a week. Where were you, and what were you doing …” Right then, a series of major aftershocks hit. Very scary!!! Geez! Thanks for sharing John. Lost my cousin, he was one of the longshoremen washed of the dock in valdez. My late husband was working at the restaurant at the top of the Hilton downtown when it hit. He daid it didnt take him long to get down the stairs. Hr never went back for his final paycheck and was afraid of height since. Thank you Gene! This is quiet a collection of fascinating stories. Thanks, Cecil! Yes, the blog, which ran for over five years, contains some really wonderful memories of Anchorage, especially during the era of the 1940s and 1950s. Jana and I graduated from AHS (the one on Romig Hill that was damaged in the ‘quake) in the Class of ’60. I do encourage your readers to browse the stories of Anchorage. An unforgettable collection, for sure. We (Last Frontier Magazine) have published a few stories from some of your contributors in the magazine, and would love to do more. I congratulate you on the fantastic job in creating the blog to capture those stories. While entertaining, they are also very important to record for future generations. Jana Nelson, the founder and driving force behind GrowingUpAnchorage (GUA), passed away earlier this month. As I was just a contributor to this wonderful site, I don’t know if it will continue on without her guidance. She did comment often that she appreciated the support of sites like Last Frontier Magazine in publishing stories that she had run on GUA. I did not realize she passed away. I am very sorry to hear that. This is an excellent posting for both Jana and the big quake that struck Alaska. Thanks for the link! However, I can’t seem to get a collection of only 1964 quake stories. I click on it as a category, even after using your link, and I find what only seem to be stories of more random subjects. Am I doing something wrong? I love to read stories about the quake as told by people who actually experienced it. I turned 6 the day before the quake. My family had just been to the bank in downtown Anchorage and signed papers on the sale of our house!. My dad went back to work at Ed’s Electric, same street that fell two stories. Mom took my sister and I to Woolworth’ s Depth. Store to shop for Easter gloves and purses for our new Easter dresses just purchased at JCPENNEYS when the quake hit. Mom grabbed us and we tried to get outside to cross the street, but the street Rose clear up in the middle when we were crossing. Mom took her high heels off and we started running to the other side. A drunken man came out of a bar and a man with a suit on came out and stood with us as the street rolled. My mom told everyone to take hands and she started praying for our safety. Didn’t realize the same street a couple blocks down had sunk so far. Amazing, still remember it like yesterday. I get out the slide projector and watch the slides every few years. On March, 27, 1964, I had only been in Alaska for 11 months. My husband and I left our 4 month old baby girl was with our neighbors to go to Good Friday Mass. Fr. was reading from “The Passion” when the shaking began. It shook for awhile then let up only to start again but much more violently. The church was an A frame building and the shaking was so violent the beams were twisting back and forth. Fr. couldn’t stand up and fell to his knees. I remember some people jumping over pews to get out of the church. I thought I was in as good a place as I could be because I really thought it was the end of the world!! I fell to my knees as well and stayed there praying until the shaking stopped. It wasn’t until we got home we realized how bad things were. Our neighbors and our daughter were ok but there was no water or electricity for nearly a week. Another neighbor had a fireplace so we and two other families pooled our ready to eat food, blankets, etc. and moved into their house. All the doors were kept closed and basically we all lived in one room. Water trucks came by with water daily. Of course, there were the after shocks…that were emotionally devastating. I know people who lost their loved ones and all they owned. It was so terrible! I pray there is never another one like that! I lived on St Elias ,in a neighborhood called Turnagain By the Sea. That area took a beating, we had big pipes running across the front yards of most of the houses there. I had just turned 13, so was in 7th grade. It was a miracle that because of Good Friday, the schools were closed, and most children were at home. Thank you for this Cecil. I was 13 and my brother Doug was 12. We had just returned home from school at Kodiak Elementary to the Woody Island FAA compound on the Fedair 4 shortly before the quake hit. We went to our back yards facing the channel and Long Island high up on the cliff. The houses were swaying, and one could see the shock waves from the ocean and the land. We later found that one of the three tsunamis had come through the forest and across the flats down the hill from our housing and Station area into Elephant Lake, which was our water supply. There were a few deep crevices opened up by the lake as well. We lost our dock, and Mission Lake near there became a lagoon. It was an insane and amazing thing to see houses from Kodiak floating by the bones of the dock and in Chiniak Bay that separated us from Kodiak. Beachcombing was interesting for some time. All who lived through this were greatly affected by it will never forget it. Glad I found this site. Not too many of us left. I was 10 watching fireball xl5. A few years earlier the Cuba missile crisis taught us duck and cover. The teacher told us if somebody pulled the trigger it was the end of the world. Then Russia was suspected in the Kennedy assationation in ’63. Then March ’64. You couldn’t stand up if you wanted to. The front door flew open and Minnesota drive looked like ocean waves. Power poles flying. Sparks. Neighbors house crumbling. I was 10. It was the the end of the world…and it didn’t let up for 5 minutes.when it stopped houses were swalloed. Children died. The water wasn’t safe so we boiled snow water. Then the aftershock hit! I lived on Elmendorf FAB and on this day, we were home from school because it was good Friday. When the Quake started, I remember giggling because that’s what we usually did. But this time the shaking got worse and didn’t stop as usual. We started to run for the door but the cabinets were flying open and shut and dishes were flying everywhere. I remember looking out the window and saw out truck and camper rocking back and forth. Almost tipping. It was quite an experience and one never to be forgotten. I was 9 years old when the Good Friday earthquake hit. We had just moved from Whittier, AK (thank heavens!). My dad was home with me, my brother and sister, while mom worked, out at the airport. We would learn later that my mom was standing in fear under the wing of an airplane and someone would suddenly push her to safety before that wing fell to the ground. We were safely home watching cartoons on TV, which was strange as we were usually scattered outside playing. I remember the roar that came, before and after. It was eerie. Then the shaking, it went on forever. We prayed the entire time for God to just make it stop…over and over “please God make it stop”…all the while watching cupboards opening and slamming shut and possessions being toppled all over. We were living at 225 E. 8th Ave…right by the cemetery and just 4 blocks from the 4th ave devastation. It’s a parking lot now. Our house only had a few cracks in the walls, out side of all the things that toppled over from the incessant shaking, it was minimal damage. Growing up in Whittier, I remember tremors all the time and they never scared me. But, after ’64, it doesn’t take much to move me to cower in a doorway. As soon as the quake stopped, my dad gathered us and we left for my uncles home, not too far from where we lived. I remember picking up a porcelain cat nicknack, that had fallen off the window ledge onto the floor, and I carried that thing the rest of the day. I was 6 years old and remember vividly. My Mom and I had gone to JC Penney’s earlier in the day to purchase an Easter hat. Following our trip to Penney’s we went to the commissary on Fort Richardson. When the earthquake started we were in the meat department at the back of the commissary. At first, everyone stared at each other and I remember clinging to my Mom. The fluorescent overhead lights were swinging so hard they were breaking as they hit the ceiling, I remember shards of glass falling while watching all the glass bottles of ketchup, mayo, pickles, etc. falling to the floor and breaking. Meanwhile, a man in the meat department yelled for everyone to go outside thru the back exit, unfortunately the door was locked, we watched him try to run to the front of the commissary to get the key to the door. The floor was rolling! He ran back with the key and let us outside. The earthquake was a long one and was still going strong when were finally outside. The cars in the parking lot were slowly rolling into each other as the ground was rolling like ocean waves. When we returned to our quarters, our TV was broken, everything on shelves and in cabinets were on the flour broken. In typical Army fashion my Dad was deployed to Valdez, so my Mom and I were left on our own with no water or power. Army trucks went around the quarters delivering water and purification tablets. I don’t remember how long it took for utilities to be restored. I don’t see many folks commenting on the aftershocks. I thought they were terrifying, sometimes just a quick jolt and other times they rocked and rolled. Directly after the earthquake the “tremors” were very close together time wise and gradually subsided. Now I live in WA, on occasion there are earthquakes here, instinctively I look up to see if light are swinging. It never leaves you. I was 6 years old also at the time of the 1964 quake. My father Captain Donald Poe was stationed at Elmendorf AFB. As with many of you I was sitting watching cartoons when it hit. My mother was frying pork chops in the kitchen preparing supper. All of a sudden cabinet doors opened. Cans rolled out onto the floor and were rolling around. The refrigerator door opened spilling its contents and a glass ice tea pitcher fell out and crashed on the floor. There probably would have been A grease fire had it not been for the bag of flour falling out of the cabinet and pouring its contents into the frying pork chops. The china cabinets doors opened and all my mothers wedding china crashed on the floor. Very little survived. My dad who was upstairs changing out of his uniform came running and grabbed my hysterical mother and I and rushed us outside. We were in base housing in an area called Cherry Hill. High above Cooks Inlet. Families of 6 were in each building clustered around a playground in the center. After the shaking stopped my dad knew he had to go back into the base. My dads boss said his wife was alone so he told my dad to take us to his house. So we stayed there for several days while the men were getting things in order after the disaster. And I remember the aftershocks! I was told to get out of the house and go stand on the front porch if I ever felt anything. I remember waking up feeling my bed moving for many days and weeks after the earthquake. The slightest movement would send me running downstairs and out to the front porch. There I would be standing and seeing other families standing on their front porch , And there would be many other times where I would make the dash to the front porch and be standing there alone in the dark or in the day and never see any people. I had been traumatized by the earthquake of 1964. My older sister and her family were living in Valdez on this Good Friday. God is good.. they all survived. For us in Minnesota, it was a very long night listening to the radio and pinpointing towns and cities on an Alaska map. Finally around noon Saturday, we got a phone call that they were safe. Apparently my brother-in-law picked up the phone and somehow connected to a ham operator who put the call through. My sister and two-month old niece arrived in Minnesota a couple days later. The day still haunts those of us who are still living. But we always give thanks for keeping our family together during this time. I was 6 when it hit. We live in Glennallen (back before they added the 2nd n). I had just come inside and wound up in the boot box by the door, that’s where I rode out the entire thing. I remember watching things falling off of shelves and seeing my father stick his foot out to stop the piano from rolling across the floor. We had to evacuate the town for fear that the tower would fall. I remember the roads were all cracked and split. I’ve been in a few shakers since but they just don’t compare. I was also 6, and my three brothers and one sister and I were watching Fireball XL5. Mom was cooking and when she realized it was a big earthquake, got us all out in the back yard but my sister and I kept trying to run under the carport, which was freaking mom out. I very clearly remember thinking the sky was falling. Must have recently read Chicken Little. And I remember dad going downtown to collect water in jugs from the army water trucks. And my mom putting a drop of Clorox in the water until it was safe to drink again. And coffee cans for toilets. We stayed with friends in their trailer in Peterscreek area for a bit. Had Easter egg hunt out there in he snow. Dear Hertha and Chris. Oh, and the Sea Rations the army gave out. Those were so cool, for us too young to do the worrying. I was in the Air Force stationed at Elmendorf AFB, when the earthquake hit. I was 20 years old. I remember going to the base bowling alley, and questioned a man what happened. He laughed, and stated he threw one ball and got ten strikes. Four of us spent three nights in a 1954 Ford. We had C rations for a number of days, and at a kindly Staff Sergeants home until called to the base for duty. It was an experience I, of course, will not forget. Thank you for all the pictures! We lived in Anchorage at that time. My husband was in the Air National Guard and worked civil service for the ANG. That morning our neighbor had hit our car coming around the corner and he and my husband were on there way home from a visit to the insurance company. They were near Spenard Rd by the Montgomery Wards store and thought the tires were going flat because they were bumping so much. Then they saw bricks popping out and someone running out holding their head. At home, dishes were flying out of the cupboard and in the driveway we had a vehicle that moved sideways many feet. Our bed was turned completely around in the bedroom as well. The neighborhood got together and we stayed in one home to save on fuel because we weren’t sure what was going to happen. A very frightening time and one I will never forget. I was in it too . Just got out of the 4th Ave theater and rode it out hanging onto a parking meter . Wow, some stories here! Thanks for the tidal upheaval photo. I understand the heave in Cordova was 11 feet, and pretty much ended their razor clam industry. Although I am not an Alaskan. down here in New Zealand, we felt (at least, I did) the tailender of this one. Felt like a deep thump! I was in the third grade at Creekside Elementary living in the Turpin housing are by Muldoon Road. My dad was a captain in the Air Force at Elmendorf Air Force Base. My mom was frying shrimp on the stove in a cast iron skillet which all fell in the floor when the earthquake started and everyone else was in the living room waiting for Fireball XL5 to come on TV. I was outside alone holding a giant ice cickle I was going to show my 5 siblings. I dropped it when the earthquake started. The next door neighbors came running out of their house and were yelling for me to pray because its the end of the world. Marshall law was in effect the next day but my Dad and I drove around in a staff Air Force car looking at the damage. We went to the Turnigan Arms addition where a lot of the land broke off and went out into the sea, taking houses with it.